With the onset of the third millennium, increasing numbers of corporations around the world have been undergoing cultural and mindset shift paradigms whilst developing corporate strategies that are increasingly attuned to the highly competitive and dynamic business realities arising from globalising national economies around the world. This research book represents an eclectic collection of latest research articles and empirical studies conducted in different parts of the world on corporate strategy, including usually neglected countries of study such as Germany, Turkey, Greece and Spain. 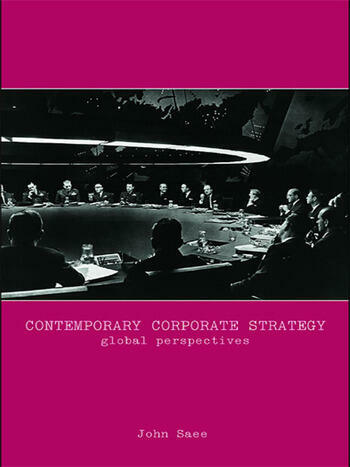 This research book contains over twenty research papers examining various aspects of corporate strategy in different national and international settings, this book is intended to equip readers with the latest knowledge to understand the complexities of corporate strategy both at a theoretical and operational levels. Further, the book is specifically written with the needs of the students of strategy both at an undergraduate and postgraduate who may want to gain contemporary knowledge of strategy based on empirical research. John Saee is Professor of International Business, Corporate Strategy and Managements and Academic Director of the Doctoral Program at the Australian Graduate School of Entrepreneurship, Swinburne University of Technology, Melbourne, Australia.